This week our Etsy shop comes to us from Brunswick, OH. 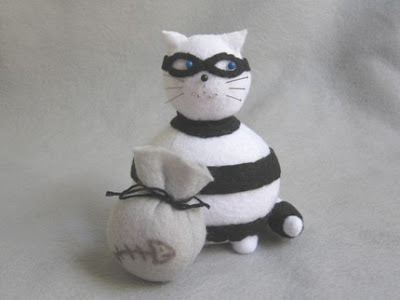 Fat Cat Crafts features handcrafted pincushions, dolls and other fun goodies handmade by Kathleen from her own patterns. Kathleen is also doing a great thing for charity with her shop..giving $1 for every item sold to The World Wildlife Fund, which is one of my favorite charity organizations as well. 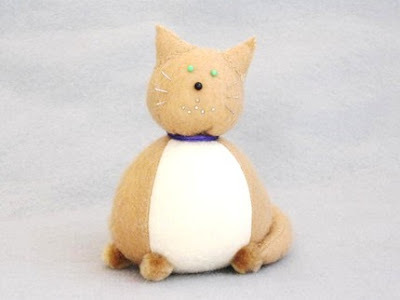 Consisting of 1 cat pincushion and 15 assorted pins this kitty will be perfect as a gift for any sewer. I think it would be equally as cute as a gift for non-sewers who collect cats. Also a pin cushion this green eyed kitty is decorated in a purple collar made with embroidery floss. He stands approximately 5inches tall and is 10 inches around his belly. Horus is a sneaky kitty running off with a bag of fish. He stands approximately 5.75 inches. 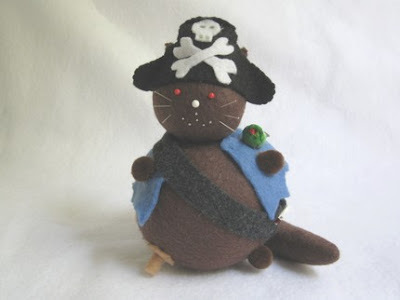 This fearsome pirate sails the high seas stealing fish and catnip. When he isn't busy doing that though you can feel free to use him to keep all of your pins handy! Now to the part you have all been waiting for! 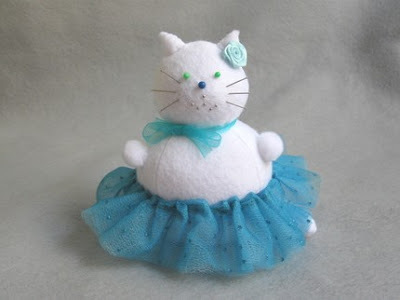 This week our lucky winner will win any item of their choice from Fat Cat Crafts! 1. Check out Fat Cat Crafts. Come back here and tell about your favorite item. Entries will be accepted through Saturday midnight. Check back here Sunday to see if you are the lucky winner! Those "fat cats" are really cute LOL! She is just too cute and fashionable. I LOVE the pirate cat. OMG I need a pin cushion sooo bad. I currently stick my needles in soap. yes soap. lame lol! Leah: Soap?? That's a new one, definitely never heard of using soap! Does that really work? I'll have to remember that nifty trick!